In addition to the development of early running horses from hobbies, galloways and early imported oriental bloodstock at Helmsley, Sedbury and the Yorkshire-Durham border, the foundations of the thoroughbred breed were established further south in Yorkshire, around the City of York and Tadcaster. 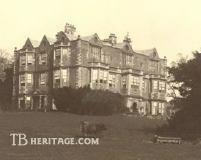 Goldsborough Hall, West Riding, Yorkshire, where the Byerley Turk was located in his later years, c. 1920. Photo courtesy Pat Wood, Goldsborough. Bolton Hall, near Richmond (northern Yorkshire), early 19th century. An important Byerley Turk daughter was owned by the Duke of Bolton. The Byerley Turk(foaled c. 1680) was the first of the important three progenitor stallions. He arrived in England during 1687. The English army officer Captain Robert Byerley (d. 1714), who later rode him in the Battle of the Boyne in Northern Ireland, is conventionally considered to have captured him at the siege of Vienna. Byerley was one of a group of English adventurers who had joined the Hungarians in their struggle against the Turks. Byerley was in the 6th Dragoon Guards and later the Queen Dowager's Regiment. He married Mary Wharton, a grand-niece of Philip, 4th Lord Wharton (another racing family) in 1693. The Byerley family initially lived at Middridge, just across the Tees river in County Durham and later moved to Goldsborough Hall, near Harrogate and Knaresborough in Yorkshire's West Riding. Middridge is close to Streatlam, the home of the Bowes family, where the important Byerley Turk mare, head of Lowe's Family Number 3, was located. John Bowes (1814-1885), who bred four Derby winners at his Streatlam and Gibside (County Durham) studs was a descendant of this family. The Byerley Turk also sired a mare bred by Sir William Ramsden, of Old Langley Hall near Huddersfield (5 miles from Halifax) and Byram Hall (4 miles from Pontefract). This Byerley Turk Mare's daughters, were all bred by Charles Paulet (1661-1722), the second Duke of Bolton, whose father, the sixth marquis of Winchester and first Duke of Bolton married the illegitimate daughter of Emmanuel, the last Lord Scrope of Bolton. The first Duke erected Bolton Hall on the ancestral Scrope lands near Richmond, North Yorkshire in 1678. The Bolton-bred daughters of this Byerley Turk mare were the foundation of the statistically most successful female line, Bruce Lowe's Family Number One. Byerley Turk was at stud as late as 1696 and was (through Jigg, Tartar and Partner) the great-great-grandsire of Herod, foaled in 1758, bred from the stock of Sir William St. Quinten of Scampston, near Malton, by the Duke of Cumberland at Windsor. Herod ensured the survival of the Byerley Turk line. Robert Byerley, who served as an M.P. for Knaresborough, died in 1714 and is buried at Goldsborough. The estate was sold to the Lascelles family in 1766, following the death of Elizabeth Byerley. The Lister Turk was another stallion in the General Stud Book who was taken during the siege of Vienna in the late 1680s. His capture was effected by the young Duke of Berwick (illegitimate son of James II and Arabella Churchill), who joined Charles of Lorraine in freeing Buda from the Turks, and later fought for his father's losing side at the Battle of the Boyne (1690). The Lister Turk ended up in the possession of Matthew Lister of Burwell Park, near Louth, in Lincolnshire. As a stallion, he had an influence on early running horses in Yorkshire, through his daughters, and through his son, Lister's Snake: Regulus, Marske, Gimcrack, and other famous north country runners carried the Lister Turk's blood. Aldby Park, near York, was the home of the Darley Arabian. Early 20th Century view. North Milford Hall, near Tadcaster, site of the famous Leedes stud. Photo ©David Wilkinson. The Darley Arabian(1700-1730) was ultimately the most successful of the early imported oriental stallions, and modern breeding preferences are still increasing his influence in the Thoroughbred. In 1704 Thomas Darley, a merchant and British Consul in Aleppo, sent him to his father, Richard, at the family seat at Aldby Park, near Buttercrambe, ten miles east of York. The Syrian port of Aleppo was one of the main ports for shipping horses from "the orient," and other stallions, such as Lord Oxford's Dun Arabian and The Bloody Shouldered Arabian embarked for England from there. The Darley Arabian was regarded as particularly handsome, with a white blaze and three white feet. A near life-size portrait of him survives at Aldby Park, still owned by the original family. There is another portrait of him by early 18th century sporting artist John Wooton, with the jockey wearing the green and gold colours of the Darleys. The Darley family supported York races in the early 18th century. Richard Darley died in 1706, and Aldby passed to his son, Henry. After Henry's death in 1720, the property passed, through marriage to the Brewster family via Jane Darley's marriage. The Darley Arabian remained at Aldby throughout his long life, but covered relatively few mares. However his unions with Betty Leedes produced two of the most important horses in the history of the Thoroughbred; Flying Childers (1715), the most successful racehorse of his day, and Bartlett's Childers (1716), to whom we owe the continuance of the Darley Arabian sire line. Edward Leedes(c.1638 - 1703), of North Milford Hall, near Tadcaster, bred Betty Leedes (foaled 1705), the dam of Flying Childers and Bartlett's Childers. Betty Leedes passed into the North Yorkshire stud of Leonard Childers who bred from her her famous sons. Leonard Childers married Ursula Wyvill, another example of the extensive links through marriage of the early northern developers of the thoroughbred. Bartlett's Childers, unsuccessful as a racehorse because of weak blood vessels, stood at the stud of John Bartlett (1707-1769) of Nutwith Coate, near Masham, North Yorkshire, which borders Yorkshire's West Riding. John Bartlett had ties to the Yorkshire Conyers, Wyvill, and Hutton families through blood and marriage. The Leedes Arabianwas imported in the latter quarter of the 18th century and stood at the Leedes famous North Milford stud, where he got Leedes, later owned by Queen Anne's consort, Prince George of Denmark. Leedes became a stallion at the Hampton Court royal stud, his descendants through his daughters included the famous American foundation mare, Selima. The Leedes Arabian also sired some daughters with a lasting influence on the breed. Leedes was a staunchly royalist family who had suffered in the Civil War when North Milford Hall was bombarded by passing Parliamentary troops. Mary, a daughter of Robert Leedes, married Edward Rookes, who took the Leedes name, in 1740; Edward Rookes Leedes was a prominent Yorkshire racing man and horse breeder, who stood the famous racehorse (Bolton or Old) Starling (1727) at North Milford after his racing career was over. He also bred Tartar (1743), the sire of Herod. Edward Rookes Leedes, who was an investor in a variety of enterprises, later ruined himself through gambling debts. The Godolphin Arabian (1724-1753), the third so-called foundation sire, arrived in England later than the Darley Arabian and the Byerley Turk, in about 1730. He initially stood at Edward Coke's Derbyshire stud and later came into the ownership of the Second Earl of Godolphin and took up residence at the Earl's Babraham Stud in Cambridgeshire. He is regarded as adding further eastern quality to the breed at a time when it was beginning to languish, but following him there were relatively few significant imports of eastern stallions ‚ the work of the oriental horse had been completed. Matchem (1748), the grandson of the Godolphin Arabian through which the sire line continued, was located at William Fenwick's Bywell Hall stud in Northumberland. 1832 view. The Godolphin Arabian, though eventually at Babraham in Cambridge, had Yorkshire connections through the Coke family (and marriage to Cary Wyvill), and the Godolphins, who were intermarried with the D'Arcys. As the sire of John Martindale's Regulus (1739), a favourite Yorkshire stallion that led the England's sires lists eight times, he was the grandsire of Spiletta, the dam of Eclipse, through whose line he descends. The Godolphin Arabian was also, through Cade, the grandsire of Matchem,and the head of its persistent sire line. Cade ended his days at Easby Abbey, about a mile from Richmond, Yorkshire, in 1756. In the East Riding several families contributed to the horse rearing and race activity. Amongst these the Bethells of Rise Park, near Hull, the Stricklands of Boynton, and the Piersons of Lowthorpe were among the most prominent. Both the Bethells and the Stricklands acquired their estates under dubious circumstances from dispossessed Royalists during the Civil War. Hugh Bethell was a supporter of early racing at Bramham Moor and York, and owned some several famous runners around the turn of the 18th century, among them Castaway, Ruffler, and Woodcock. The family was active in racing throughout the 18th century, racing at Boroughbridge, Hull, and other Yorkshire venues. Sir Matthew Pierson and Sir William Strickland were neighbors and racing confederates. Sir William owned the Strickland Turk, apparently an imported horse, also called the Carlisle Barb. He also bred Grey Hautboy, a grandson of the D'Arcy White Turk, and a fairly influential sire that appears to have stood at stud at Boynton. Grey Hautboy was the sire of Sir Matthew's famous race horse, Bay Bolton (1705), who later became a very important stallion in the Duke of Bolton's stud. Another Grey Hautboy son bred by Sir Matthew was the grey Lamprie, a famous runner at Newmarket. Sir Matthew also bred (Old) Merlin, who was raced by Sir William Strickland, and later retired to stud at Boynton, where he sired, among others, Hugh Bethell's Castaway. There was a notorious "north-south" match at Newmarket in the beginning of the century between Merlin and an unknown horse of Tregonwell Frampton's. After much chicanery Merlin won, resulting in the ruin of "several gentlemen," and leading to a change in the laws on gambling. It became technically impossible to recover debts of more than £10. I must and will leave thou"
and their horses and riders and all. Another family of interest in East Yorkshire is the Appleyards of Newbald. The family bred Bald Charlotte,foaled at Hambleton in about 1720. She was got by Captain Appleyard's Old Royal, a son of the Holderness Turk and a Blunderbuss Royal mare. Whyte says that she "...was thought too be the best mare in the kingdom in her time." The original foundation sires through their progeny, between 1748 and 1774, produced four stallions of continuing significance in the sire lines of modern bloodstock; Matchem(1748-1781), Herod(1758-1780), Eclipse(1764-1789) and Highflyer (1774-1795). They provide the link between older original breeders of the north and the wider spread of the Thoroughbred, which by the mid 18th century had started to move to the more prosperous areas of the south. Of these only Matchem was bred in the north, by John Holmes at Carlisle, Cumberland, and sold to William Fenwick of Bywell in Northumbria, where he stood for most of his career. The others were associated with southern owners and racecourses demonstrating the shift to the south that was beginning towards the end of our period. By the later eighteenth century the great northern breeders were no longer at the forefront of thoroughbred breeding.